I’m going to turn your world upside down today. Where are all my Moscow mule fans out there? Do we love our ginger beer or do we love our ginger beer? Fun fact: I actually am not a huge fan of fresh ginger, it’s a little too harsh for me. But I know it is soooo good for me that I still try to work it into my diet in any way possible. Ginger beer totally counts, right? Especially if you get the good stuff. Our current faves are Fever Tree and Reed’s Ginger Brew. It’s important that we go for an authentic, hand-crafted ginger beer as opposed to a highly processed, highly sweetened version. Trust. 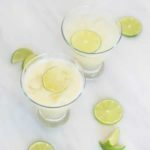 So today I’m putting a spin on the classic Moscow mule and bringing you a Cherimoya Mule! Have you heard of this magical fruit? It is sort of like a softer, tropical version of a pear IMO, but others have described it as tasting like a cross between a pineapple and a banana. I was first introduced to it at the Farmers’ Markets in Hawaii when I lived there, and I was so excited to see that our local Santa Barbara markets carry them as well. Cherimoya doesn’t grow well in extreme temperatures, so it makes sense that it’s able to thrive in this area’s mild climate. It’s green in color, with darker dimples, and is usually heart-shaped. Neither the skin nor the seeds are edible (in fact, they are toxic when crushed) so be sure to just enjoy the pulp! I was encouraged to try my hand at a recipe using cherimoya by my good friend Rebecca. She and her husband, Eric, run a passion fruit farm in Uganda that teaches girls who have dropped out of school how to be successful growers and businesswomen so that they can make a living for themselves without that formal schooling (check them out at Kadafrica.org!) I love this business model and think it is so vital to Uganda’s economy. They have seen great success which I know will only just continue to grow in the coming years. Anyway, I was What’sApp’ing (is that a word?) with Rebecca a little while back and she sent me a photo of cherimoya, asking if I’d ever seen it. Why yes I had! She said that she and Eric are interested in trying to grow it on their farm, and that I should maybe pick some up to try in a cocktail and MAYBE find a way to send her the seeds so they could start harvesting. Challenge accepted! I wasn’t really sure where to start with “juicing” my cherimoya, but as soon as I picked a couple of pretty ripe ones from the Farmer’s Market, I realized the juicing task was nothing a fine mesh sieve couldn’t handle. I simply cut the cherimoya in half, removed the large black seeds, and pressed all of the pulp through the sieve. The result was a white, milky-looking substance that tasted like pineapple-pear juice. I was digging it! 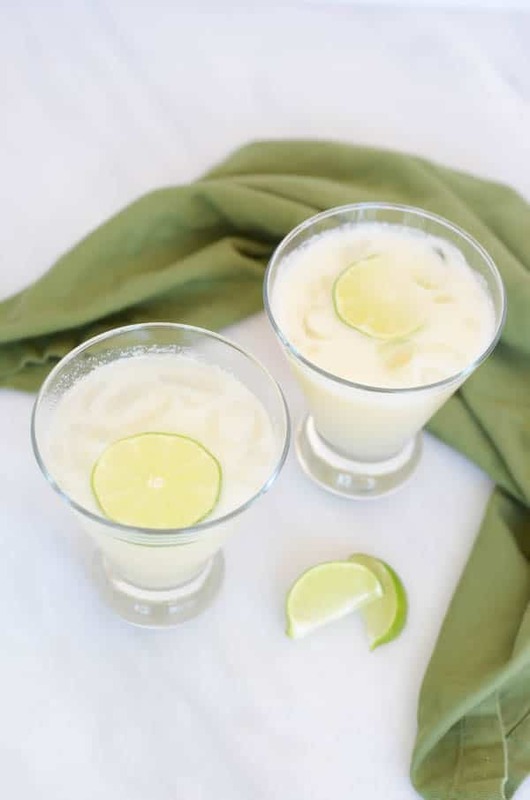 Because the cherimoya juice is fairly sweet, I wanted to cut it with some stronger flavors. Enter ginger beer and fresh lime juice. And those two ingredients were really all it needed. Oh, plus some gin (can’t forget the alcohol!) because I always prefer gin to vodka…It’s just so much more flavorful! 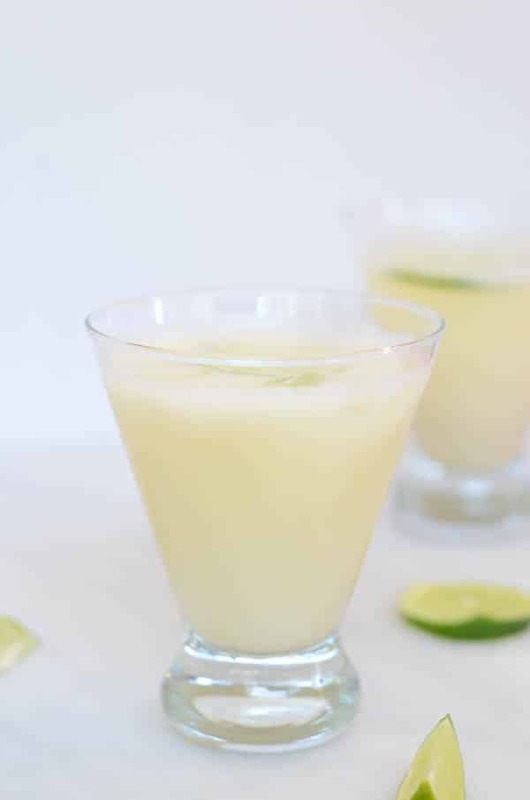 It gave the Cherimoya Mules the perfect herby, floral character that really balanced out all of the other flavors. So, what do you think? 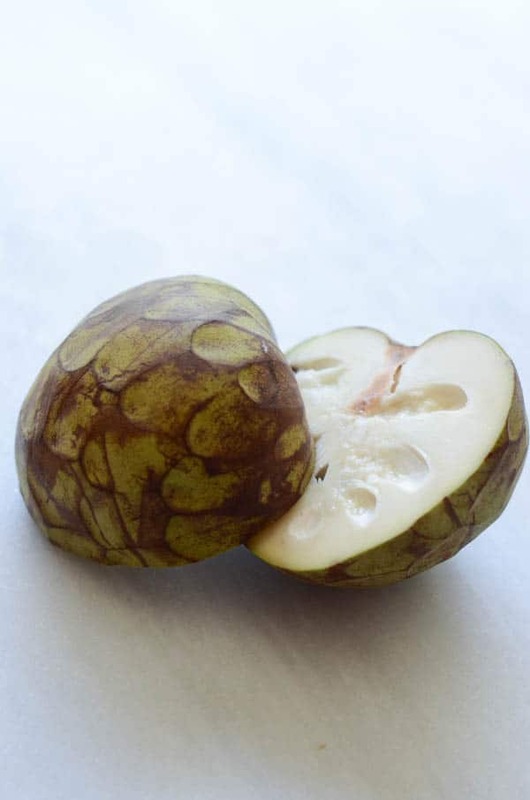 I realize that EVERYONE might not be able to track down cherimoya at their local Farmer’s Market, but I encourage you to keep an eye out for it. Now, if you see those dimpled, funny-looking heart-shaped orbs, you won’t be wondering what the heck they are. And if you can’t track down cherimoya locally, guess what?? They are on Amazon! I know, I couldn’t believe it either. 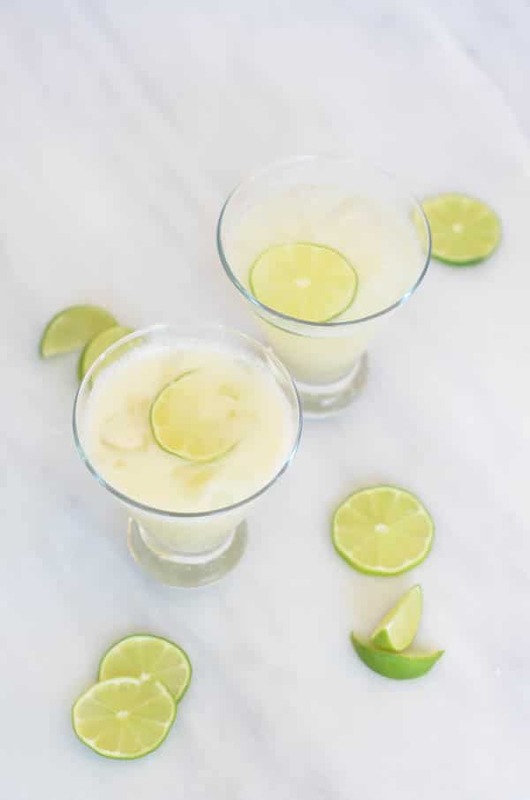 So go get yourself some of these beauts (well, at least they’re beautiful on the inside) and make yourself a Cherimoya Mule (or two) to kick off this here weekend. I’ve got a couple more cherimoyas in my refrigerator that are just begging to be juiced, so you know what I’ll be doing when I get home from work today! Oh, and hey! I’ve finally joined the Snapchat world! Find me @caligirlcooking. I’m still learning the ropes and getting comfortable with it, but keep an eye out for lots of fun snippets to come. You can also find me on Bloglovin’ if you haven’t already! Have a great weekend everyone! 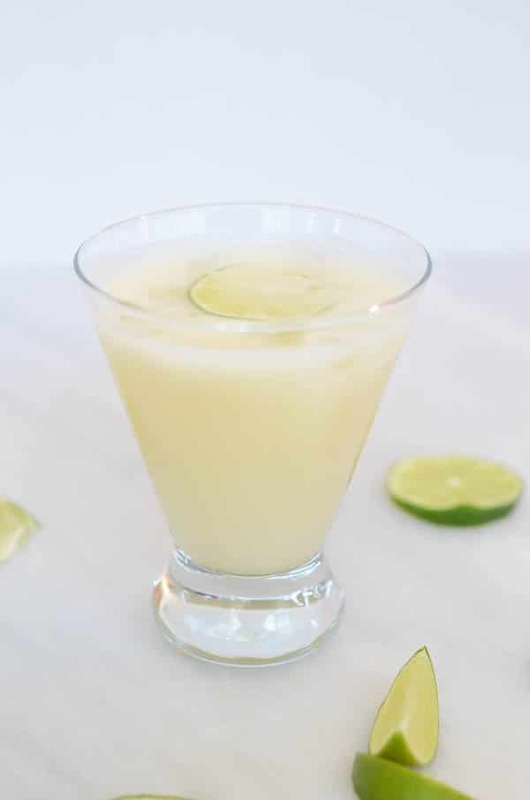 A tasty take on the Moscow mule adding juice from the tropical cherimoya fruit and swapping in gin for vodka. Combine all ingredients in a rocks glass over ice (or a copper mug if you have them!) Stir to combine. Garnish with a lime wheel. Enjoy!